There is a small class of events within the gospels that are treated in a special manner by iconographers. This special treatment reflects the language of Scripture as well. In the icons of the Transfiguration, Pascha and the Ascension, there is a particular artistic device used called a Mandorla. Sometimes circular, sometimes almost star-shaped, it serves as something of a “parenthesis” within an icon. What is being set in the parenthesis is an event which somehow transcends what most of us think of as normal. Revealed in the context of a mandorla is that which we know by the revelation of Scripture but which might not have been witnessed by the human eye – or – if witnessed – somehow transcended the normal bounds of vision. The disciples are described in the Scriptures as having been “afraid.” St. Peter speaks of building three tabernacles, “because he did not know what to say.” The experience is more than even the words of Scripture can express. The depiction of the Ascension in iconography has this same artistic device. Some would perhaps wonder why an event that is described in a prosaic manner “a cloud received him from their sight” should need to be framed within the parentheses of a mandorla. Of course, this description is given only in the book of Acts. Mark and Luke simply say that he was “carried up into heaven.” We are at a place where language has a limit. Indeed, Mark says that he was “carried up into heaven and seated at the right hand of God.” This last formula is a creedal confession – but not an eyewitness description. That Christ was taken up and that He is seated at the right hand of the Father is the faith and dogma of the Church. But the Church knows this in a mystical manner and not in the manner of a newspaper reporter. To acknowledge this is not to weaken the witness of Scripture or to make a concession to the historical uncertainty of liberalism. It is simply to recognize the nature of the Biblical witness. The iconographic witness of the Church affirms this – placing the Ascension of Christ within a mandorla – recognizing that this will only be known and understood by the mystical knowledge of faith (and by faith I do not mean an intellectual leap of judgment). I will return to this matter of faith shortly. Very similar to this event is Christ’s Descent into Hades, the traditional icon of Christ’s Pascha. In this icon we see what is referenced in several places within the Scriptures and upheld in the Church’s dogma – that Christ descended into Hades and “trampled down death by death, and upon those in the tombs bestowed life.” But when we confess this cornerstone of our faith we are not reciting what is known by eyewitness account. Eyewitnesses see Christ’s crucifixion and eyewitnesses place Him in the tomb. Eyewitnesses return to the tomb on early Sunday morning and find the tomb open and empty. For I delivered to you as of first importance what I also received, that Christ died for our sins in accordance with the scriptures, that he was buried, that he was raised on the third day in accordance with the scriptures, and that he appeared to Cephas, then to the twelve.Then he appeared to more than five hundred brethren at one time, most of whom are still alive, though some have fallen asleep. Then he appeared to James, then to all the apostles (1 Corinthians 15:3-7). After this he appeared in another form to two of them, as they were walking into the country. And they went back and told the rest, but they did not believe them (Mark 16:12-13). This, of course, is St. Mark’s brief account of the encounter with Christ on the road to Emmaus, described in detail in St. Luke’s gospel. We could add to that St. Mary Magdalen’s mistaking the resurrected Christ for “the gardener” until he speaks her name. Such statements are not accidental “slips of the tongue” in which the gospel writers leave clues that indicate doubts about the reality of the resurrection. This is a silly conclusion drawn by some modern, liberal scholars. The gospels are carefully written. It is absurd to assume anything accidental within their pages. What we have instead is a “verbal mandorla,” a description that points to a reality that impinges upon our reality but which has a depth that transcends anything we could imagine. This is the manifestation of the Kingdom of God in our midst. Now the eleven disciples went to Galilee, to the mountain to which Jesus had directed them. And when they saw him they worshiped him; but some doubted (Matthew 28:16-17). If Christ appears to them, how is it that some doubted? The Biblical witness would never have allowed such a statement if it was trying to defend the modern literalism of secularized Christianity. Instead, the witness of Christ points us towards the depth of the mystery that is the truth of our relationship with risen Christ. We know Him and perceive Him not simply through a set of intellectual arguments, or even simply through our trust in reliability of historical witness. A “faith” which is founded on argument, no matter how sound the argument, still fails to change the one who accepts it. The result of such “faith” is opinion, not true faith. True faith ultimately requires a union, a participation, in the very life of the risen Christ. Thus, we are not Baptized into opinions, but into the very death and resurrection of Christ. To use the language of icons, our life is plunged into a mandorla which is nothing other than the Kingdom of God. We are called to live within that parenthetical state – where our lives constant refer and point to the reality which has now filled us. Such a life transcends the literalism of doubt and opinion and enters into a union with God that is itself a witness to the coming of the Kingdom. It is the banishment of secularism and affirmation of the living truth of Christ. I would not dare to shake the faith of any nor suggest an element of doubt with regard to the events of Christ’s Transfiguration, Ascension or His Descent into Hades. Instead I want to push us towards a deeper perception and participation in those realities – for this is the very root of the Christian life. The Fathers taught us: “Icons do with color what Scripture does with words.” The iconic grammar of the mandorla, points us to the great mysteries made known to us in Scripture and make it clear that such mysteries may be known and entered into. Glory to God! This entry was posted on May 14, 2010 at 12:03 pm and is filed under Orthodox Christianity. You can follow any responses to this entry through the RSS 2.0 feed. You can leave a response, or trackback from your own site. Fr. Nicholas Solak pointed out that in the Ascension icon you reproduce here, there is also an exchange of colors meant to signify the exchange of heaven and earth. White and gold is normally associated with the upper, heavenly realm while more subdued tones are associated with the lower, terrestrial realm. However, in this icon, the subdued tone of the mandorla and the angels above and the white of the angels below preach the ascension/descent of Christ that is fulfilled in this feast. Part of what we cannot see is our human nature now sitting at (or ‘as’ in some recensions) the right hand of the Father. I have learned about icons in the past, and this post is deepening my understanding. Thank you. Although I am a Latin Rite Catholic, I learn so much from reading your blog posts, Fr. Stephan. I sure do wish both sides of Christianity, East and West, would reunite! I think the integration of both our spiritualities would be very enriching. Thank you for this added commentary – icons not only do with color what Scripture does with words – it does so in a richness that would often take volumes! God has gone up with a shout! In these icons, the Mandorla is always the universe which Christ fills! Thanks for what you wrote about the Mandorla. It is something to look for in icons. I like the idea of icons being Scriptures in pictures; and the Mandorla being the emphasis of the important doctrines of the Church with in the icons. An excellent explanation of why talk of the mandorla is not simply more liberal speak. Apparently, the mandorla does not lessen the miraculous significance, it greatly expands it. And, yes, it makes sense that if the Evangelists were worried about Karl Barth, they would have left out those pesky doubting passages. Thanks for taking the time to write this insightful post. I’m so grateful for a chance to learn more about the beyond-literal truths of faith. I have met so many people who believe that looking for a spiritual or theological meaning in Scriptures is paramount to flagrant heresy. Thank you for reminding of us where the Scriptures tell us that we see dimly, even though we see. Father, bless! Is there any significance to the shape of the mandorla? 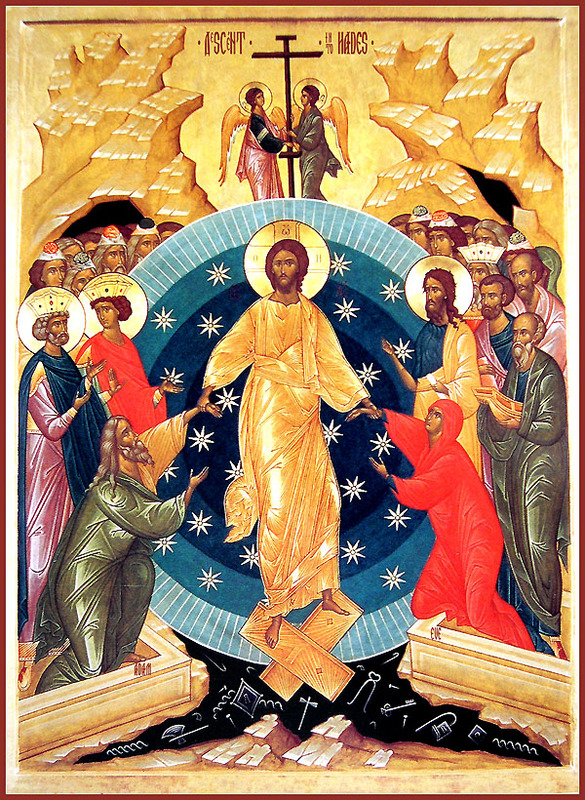 Before we had converted, my husband and I already owned several icons (of varying levels of traditionality 🙂 ), and my sister, an art student, pointed out that the eye-shaped mandorla in our icon of the Transfiguration was the exact same shape as the table in our icon of the Mystical Supper. We thought that had some pretty awesome implications! But I notice that all these mandorlas are round. They will vary in shape. I am not aware of a particular meaning attached to the shape – but that may be my ignorance. Dear Father, bless! Your teaching about the mandorla in icons here being a call to faith in its true biblical sense as participation and union reminds me of the teaching about Scripture that one cannot begin to genuinely “understand” the Scriptures apart from putting them into practice. One has to begin to live according to the Scriptures if one is to begin to understand them aright. To reduce the written Scriptures to sets of propositional statements about God and how He works is not to understand them at all in any truly meaningful sense (that is, as you have pointed out, in a way that changes us into Christ’s likeness). Indeed this is a source of great error in various sects and cults and in the modern secular and liberal notions of what Scripture means. It seems to me it is ithe result of doing just this that has led in the West to so many conflicting theological systems for understanding the Bible. Thank you for taking the time to write and post this, Fr. Stephen! Your post had me looking closely at an Eastern icon that has been with us for about 15 years now. It is an old one. The shape of the Mandorla (Italian for almond) is still, here, almond-like although the apex has taken on the form of a Middle Eastern arch. The Mandorla metaphor would be an allusion to continuity — of the Levite priesthood in particular, the Tabernacle of Testimony and the budding of Aaron’s staff, first into blossoms and later into almonds (Numbers 17:21–23). Even the icon of the Dormition of the Theotokos has a Mandorla but the cross is Russian. You mentioned Father Nicholas Solak. He is my priest at Holy Trinity. Do you attend Holy Trinity? God bless this blog. It has shown me the beauty of Christ and tonight, possibly saved me from further self destruction. I can’t utter words to explain this. Modern society is such a lonesome place. Just to add to your post, the concentric bands of shading seen on mandorlas almost always show them getting *darker* towards the centre. The icons you posted show this too. I believe this is an allusion to the “cloud of unknowing” that Christ’s disciples passed through in order to hear the voice of the Father. Google sent me to your website as I was trying to find more information on Mandorlas as representations of the Trinity :-). The mandorla in the Descent into Hades icon has three different shades of color from a deep black in the middle to a lighter outer band. I have assumed these were to represent the Trinity and have heard others say the same, but I cannot find any references to Trinitarian symbolism in mandorlas. Do you have any information or references on mandorlas as Trinitarian symbols? I do not, myself. I would probably do searching in books on icons. There’s a beautiful one with commentary by Vladimir Lossky that might have something. The resurrection mandorla will be depicted in a variety of manners. There’s very little standardization of such things. good post. Our community is better because you are in it. If you can, shoot me an Email and we will chat more because I have an idea you will love. Geez, that is unbelievable. great post. I bookmarked it to my bookmark site list and will be checking back soon. Thank you! Appreciating the dedication you put into your website and detailed information you offer. It’s great to come across a blog every once in a while that isn’t the same old rehashed material. Excellent read! I’ve saved your site and I’m including your RSS feeds to my Google account.